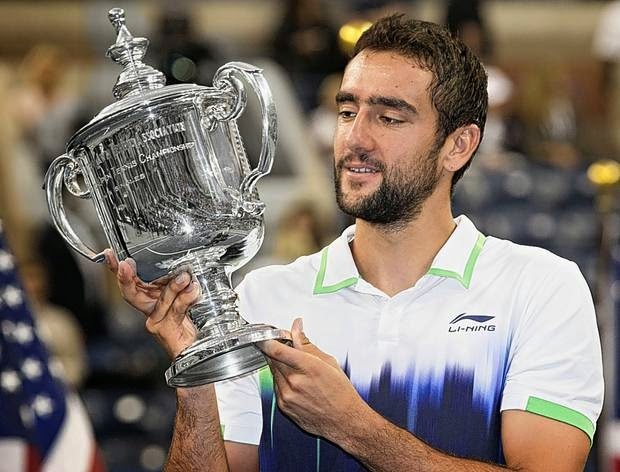 As Marin Cilic lifted the US Open title two weeks ago, it capped a remarkable turnaround in fortunes for the Croatian. Just fifteen months ago, he had withdrawn from Wimbledon through injury, although it later emerged that this was a cover for a failed drugs test in Munich earlier in the year. Cilic had tested positive for nikethamide, which appears on the WADA list of prohibited substances. After being given a nine month ban, he appealed to CAS, blaming his mother for buying the wrong glucose tablets, who then reduced the ban to four months. Along with the Viktor Troicki case, where he was banned for 18 months, reduced to twelve, for refusing to take a blood test, which he blames on confusing instruction from the tester, it raised questions about drug testing in tennis and whether it matches up to, not only what fans of the sport might expect, but also to the levels of testing in other sports. Before we delve deep down into the figures, we can look at the headlines numbers. In 2013, WADA-accredited laboratories tested 4,154 samples in tennis, spread across a number of different types of tests. This compared with 3,990 samples in 2012 – an increase in tests of 4.1%. In terms of the percentage of all of the basic samples tested across every Olympic sport, tennis represents just 1.97%. Of these 4,154 samples, there were 15 that returned atypical findings and 14 that returned adverse analytical findings. Combining those, we find that 0.70% of samples returned either atypical or adverse analytical findings. So, we have those headlines figures, but without comparison figures for other sports, they do not tell us a great deal. Taking the figures for 14 other sports, we can compile the following pie chart, representing the total number of samples taken in each of these sports. As we can see, of these 15 Olympic sports, tennis does not come out looking particularly impressive. As a sport, there were fewer samples collected than there were in judo, triathlon and skating among others. Indeed, the only sports that collected fewer samples than tennis were handball, ice-hockey and boxing. Football, as expected due to the sheer number of participants, shows up highly, but it is noticeable that cycling and athletics both conduct a very high number of tests. They are sports that have caught out major participants in recent years – Alberto Contador in cycling and Asafa Powell, Tyson Gay, Justin Gatlin and many others in athletics. Is doping more prevalent in those sports or does the fact that they conduct so many more tests simply mean that they do better at detecting dopers? Now we have seen that tennis does not necessarily show up particularly well on these figures, let us delve more deeply into the type of tests that are conduct in both tennis and in our other 14 comparison sports. Of the 4,154 samples collected in 2013, we see that 67.9% of those were basic urine tests, 15.8% were blood tests, 3.4% were GC/C/IRMS tests, 3.9% were EPO tests and 9.0% were HBOC and HBT tests. To explain these in slightly more detail, the urine and blood tests are fairly self-explanatory. The GC/C/IRMS test stands for gas chromatograph/carbon/isotope ratio mass spectrometer tests and can be used to ascertain the relative ratios of certain isotopes of elements in compounds. The ratio of these elements can vary based on certain biological processes and can be used to flag up any non-natural or adverse reactions to certain chemicals or medication that an athlete might have used. EPO is a form of blood doping that, among other effects, leads to increased hermatocrit, allowing for greater oxygen carrying capacity in the blood. HBOC is similar in that they are intra/inter-molecularly engineered human hemoglobins, optimised for oxygen delivery and longer intravascular circulation, while HBT stands for homologous blood transfusions, which increases the number of red blood cells, increasing your oxygen carrying capacity. So how does this match up to other sports? In terms of the percentage and number of blood tests, tennis actually shows up very well. Out of our other comparison sports, the second highest percentage of blood tests is rugby with just 5.7%. In terms of the raw numbers, only football, athletics and cycling conducted more blood tests in 2013. Naturally, this particularly high percentage of blood tests means that the percentage of urine tests is significantly below the other sports, but given that blood tests are generally viewed as more advanced and more likely to detect doping, this is no bad thing. In terms of GC/C/IRMS tests, the 3.4% in tennis falls behind just ice hockey and boxing in our comparison sports, although the 3.9% of EPO tests lag significantly behind a number of other sports, including cycling, swimming, skiing, skating and triathlon, all of which have double figure percentages here. However, this could represent a difference in views between those sports and tennis as to what forms of doping might be most prevalent in their sports. It was interesting that tennis did not conduct a single test for hGH (hGH isoform differential immunoassays) in 2013 – the only sport in our sample that did not use this form of testing. However, the 9.0% of HBOC and HBT tests dwarfs any other sport – boxing is the second highest percentage with just 2.3% - and the raw figures back this up with no other sport conducting more HBOC tests than tennis. Now that we have broken the tests down into greater detail, how about comparing the ratios of in-competition testing and out-of-competition testing. Generally, out-of-competition testing is likely to detect the greatest number of dopers given that athletes would coordinate their doping to avoid testing positive during competitions. We only have to look at the micro-doping and strict doping schedules that Lance Armstrong and the US Postal Team followed to see that in-competition doping is not all that effective. Of the 4,154 samples collected in 2013 for tennis, 73.2% of samples were collected in-competition compared to 26.8% collected out-of-competition. This compares to an average over all Olympic sports of 59.0% of in-competition samples and 59.4% across our sample of 15 sports. 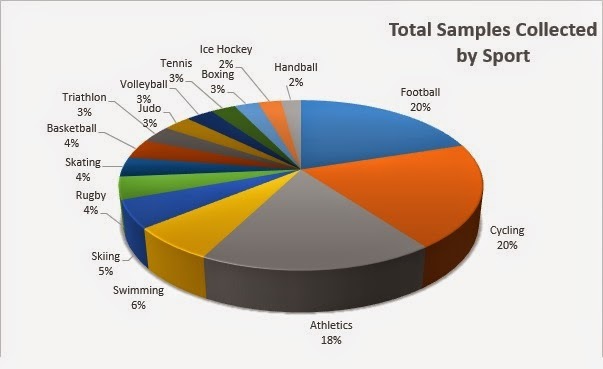 Of our sample, only football (77.9%) collects more of its samples in-competition than tennis with sports such as cycling (62.1%), athletics (54.8%) and swimming (49.4%) all doing significantly more work in collecting out-of-competition samples. Overall, there is a picture emerging that tennis could do far more in terms of structuring its drug testing to enhance their chances of catching dopers. How has it improved between 2012 and 2013 though? As we saw earlier, there was an increase of 4.1% in terms of the overall number of samples collected in 2013 compared with 2012. If we look more closely at the breakdown, we find that the number of urine tests has actually significantly decreased between 2012 and 2013, falling by 15.8%. The big rise has come in the blood testing – in 2012, tennis collected just 166 blood samples, compared with 657 in 2013. This is an encouraging sign if tennis is starting to focus more on blood testing than urine testing. The raw numbers of urine tests still significantly outweigh those of blood tests, but it is certainly a move in the right direction. Tennis has also decreased the number of EPO tests that it has conducted from 262 in 2012 to 160 in 2013 – a fall of 38.9%. It has also completed removed hGH testing, of which it collected 147 samples in 2012. Replacing these has been a 138% increase in GC/C/IRMS tests and a 6,150% increase in the number of HBOC and HBT tests. Tennis will also point to the fact that it has introduced the blood passport system. However, this is still in its very early days. In 2012, there were 74 samples taken for the blood passport system, which rose to 301 in 2013. However, comparing this to the 5,202 blood passport samples taken in athletics and the 7,429 in cycling, it is clear that it still has a very long way to go before it can start to rival the versions in the leading sports. While this all suggests that tennis is a long way from having a rigorous and reliable anti-doping testing system, there are certainly some positives. The move toward blood tests at the expense of urine tests is a step in the right direction. While blood tests are more expensive, they are a superior form of testing. 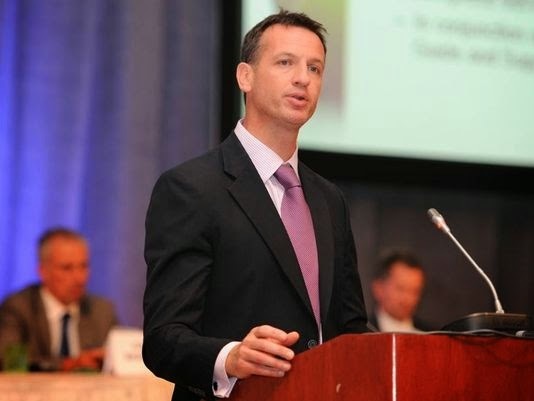 This being a long-term move is reflected in the budget increase for anti-doping from the ITF announced in recent weeks from $2m in 2013 up to a projected $3.1m by 2016 – an increase of 55%. In 2006, there were 114 samples collecting for testing for EPO. In 2013, this had risen to 160, having bottomed out at just 21 in 2009 and having peaked at 262 in 2012. Ignoring the fluctuations over the intervening period, the increase in EPO tests since 2006 has been just 40.4%. A recent study suggested that only football players log more miles in competition than tennis players do. The average tennis player covers between three and five miles in a five-set match, which would suggest that stamina is very much a concern for professional tennis players. Greater stamina will have multiple benefits – it will allow you to keep going longer, it will allow you to get into position better later in matches, it will even help the mental side of your game. To suggest that there are no benefits from maximising stamina in tennis is frankly ridiculous. However, one of the biggest problems is that there is currently little incentive for the governing bodies in tennis to actually detect dopers, particularly at the top levels of the game. One only needs to look at cycling and the reputation that the sport now has to see the damage that doping revelations can cause to a sport. Cycling undoubtedly did have a serious problem with doping in the past, but it is now arguably the sport that is leading the charge against illegal drugs – it conducts the greatest number of tests and it has the most advanced anti-doping systems. However, it is a sport that will probably forever be viewed with great scepticism because of its history with doping. Tennis, as with many other sports, does not currently have this problem. It is yet to have one of its major stars fail a doping test or come under severe, well-reasoned suspicion. If one of tennis’ leading stars were to be revealed as a drugs cheat, would there be negative repercussions on the sport? Almost certainly. Would it potentially lose some of its sponsors, some of its negotiating power? Quite likely. Based on this, there is an argument that until a sport develops a public problem with doping, it has little incentive to catch dopers itself. Particularly in a sport such as tennis where the governing body is also the same body that runs the anti-doping programme, there is a potential conflict of interest. Doping in cycling was only really exposed publically by excellent investigative work from journalist, unconnected to the UCI. Could it be that similar work could be the only way to expose any doping problem that might exist in tennis? To conclude, are anti-doping testing and measures in tennis sufficient at the current moment? Probably not. Are they moving in the right direction? Certainly, over the past 12 months, there could well be an argument that they may well be. There has been a worrying lack of progress over the past decade, but there are small signs that things might be improving. Could more be done? Absolutely.